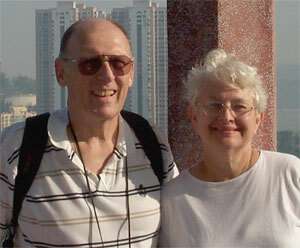 Carlson and Naomi Becker will go to Macau this fall as fulltime missionaries with the English Language Program. They will stay for three years. Carlson is the son of former Huntington College President Elmer Becker. Both he and Naomi graduated from HC. From 1964-1968, Carlson pastored the Union Church in Huntington. Then they went to Michigan to begin ten years as director and wife at Camp Living Waters, a UB camp, having worked with the YMCA and in camping during college and seminary. In 1977, the Beckers moved back to Huntington after General Conference elected Carlson to be the Director of Stewardship. He worked at the UB Headquarters in Stewardship work for 12 years. Then, in 1989, he began four years as Associate Director of Missions. One daughter, Michelle, served as a missionary nurse in Sierra Leone. Carlson left that position in 1993 and returned to the pastorateÑthe Northland UB church in Traverse City, Mich. He served that church for ten years. This summer, Beth Nelson will travel to Macau to spend time working in the English Language Program. 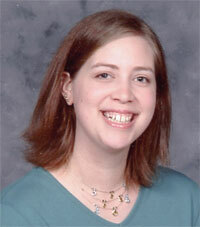 Beth is from the Mongul UB church in Shippensburg, Pa., where her father, Rev. Marc Nelson, is an associate pastor. As a short-term missionary, Beth will seek both mission experience and God’s direction for future mission service. Beth is currently an Elementary Education major at Shippensburg University. She loves children, has worked with children in several churches, and spent a summer as a missionary with Child Evangelism Fellowship. In fact, her experience with CEF pointed her toward mission work. Beth says her opportunities to share her faith and God’s Word to kids in backyard classes prepared her to confidently share her faith wherever she goes. Global Ministries is consulting with Hong Kong Conference and CEF in Hong Kong to see if they could use her for short-term work there, in addition to her work with the ELP. “On Saturday, April 4, the First Youth Convention, named “Mission Possible,” was held at La Iglesia Celular. Almost 700 youth attended the event! Fourteen Hispanic pastors brought youth to the convention. They came all the way from Sacramento to the North, and Santa Ana to the South. Pastors Manuel Lopez from UB Palmdale, Ricardo Rivera from UB Sacramento, and Amilcar Serrano from UB Simi Valley were among the delegations attending the event. At one time, Teacher Lee was an army major in Taiwan. Over 20 years ago, he became a Christian, and God called him into the ministry. Then, a little over ten years ago, he became a church planter in two villages in the mountains of northern Thailand, along the border of Myanmar. Those villages are home to the Akha people. No other Christian groups work in those villages. Teacher Lee and his family live in Lee To Village, where he planted his first church. 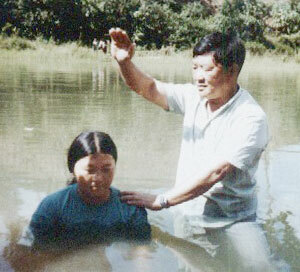 About 60 families have become involved in this congregation, and he recently baptized 33 persons. For years, as people came to Christ, they faced persecution and alienation from other villagers. Families built homes on land owned by the church so they could have a place to live. In recent years, the persecution has stopped, as people have seen the good that the church and Teacher Lee have brought to the village. Christians can live in the village once again. Teacher Lee is now planting his second congregation in nearby Loh Mah Village. They have reached 20 families. The people there face the same persecution that Lee To Village faced for years. As people come to Christ, they are no longer welcome in the village. Hong Kong Conference has asked for our help in buying land in Loh Mah village. The cost is $25,000. We want to raise half of that amount through our Vacation Bible School project. This land, a large parcel on the mountainside, would provide property for the church and space for up to 30 homes for Christian families forced to leave the village because they accepted Christ. The land is costly because the whole area is a tea plantation; it could easily be sold for that purpose. The owner lets families build temporary bamboo and thatch structures on his land in return for several days of labor each month. Church members also give this landowner 3-4 days a month of labor in exchange for the ability to have their temporary church there. These folks are poor, but they work hard and help each another. When the land is purchased, the sister church in Lee To Village will help build a permanent church. We want to help Teacher Lee and these churches as they share the message of Jesus Christ with families on the mountaintop. Your gifts will give them land to build their church, and will build homes for their families. Teacher Lee and his wife also give their lives to the 20 “Thai Tots” who live in a dormitory-type structure next to their house. Some are orphans; others come from families who cannot afford to care adequately for them. Amy Hoffman, wife of former Michigan Conference minister Ronald A. Hoffman, passed away April 5. She was 100 years old. Her husband passed away in 1979. Many people know Mrs. Hoffman’s son, Jim Hoffman, who worked on staff at Huntington College for many years; and her daughter-in-law Marda Hoffman, who served as General Treasurer of the denomination 1979-2003. Services will be held Saturday, April 9, at the Tagsold’s Funeral Home in Blissfield, Mich., with Rev. Mike Stambaugh and Rev. Joe Abu officiating. Two groups recently returned from El Salvador. They were the first short-term teams to that country. Gerald Hervey led a group from Midwest Conference, and Bob Eberly led a group from Mid-Atlantic. They mostly did church construction work. We need 5-8 more people for a short-term trip to Guatemala this summer. Randy Fennig will lead it. He is a UB pastor in Springfield, Ohio, a former missionary in Africa, and a veteran work-trip leader. This will be an opportunity to help connect our seven Guatemalan churches to the global UB church. Team members may be involved with two church building projects. Construction skills are helpful but not required. The trip will take place sometime from mid-July through mid-August, and will last 10-14 days. The cost should be $1000–$1400. Please contact Randy Fennig. Resources. Global Ministries has prepared a monthly prayer calendar to help you pray for your missionaries in 2005. Not just tied to UB missionaries, this brochure is appropriate for any missionaries you are interceding for across the world. For copies, please contact Darlene at (888) 622-3019, or email darlene@ub.org. Projects. Several new mission projects were announced in a special edition of Worldview prepared for the Self-Denial emphasis. We are delighted to report that all but one of those projects are now fully funded. You have been generous. The one remaining project involves salary support for Michael Chan, the Chinese coworker in Macau. Laurel Mission in Kentucky will soon be blessed by the addition of Burt and Tana Hey, who are going there as support staff. Burt was raised in the Prince Street UB church in Shippensburg, Pa. Tana was born in Belize as the daughter of Mennonite missionaries. Burt will be involved in youth ministry, overseeing work groups and projects, maintenance, and technical matters. Tana will help in the school, daycare, and Vacation Bible School, and in preparing for camp guests. The Heys plan to go to Laurel Mission in June. They are currently building their support team. If you would like to be part of that team, please contact Tana at the Prince Street UB church office,where she works: (717) 532-8404. M. Adam Will began his tenure as the new fulltime minister for Eden UB Church in Reedsville, Ohio. He is the first fulltime minister in a few years. Adam is a member of Eden’s sister congregation, Mt. Hermon UB, located in Chester, Ohio. Just 19 years of age, Adam is a Bible College student. He has had a heart for being a minister and prayed where God would lead him. With the help of his pastor, Rev. Peter Martindale, who also preached at Eden years ago, Adam found out that Eden, where he has spoken before, was searching for a pastor. God has truly had His hand in this endeavor. In the month Adam has been there, one person has already placed membership at the Church.